STEED'S VIEW: First Things First! The most important job to do in the morning and for the rest of the day to go smoothly is get the coffee on! We don't just use any old coffee here at Steed we only use Carlisle's finest. The Venetian Blend from John Watt & Son. 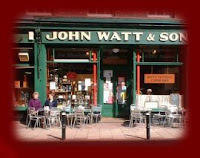 John Watt & Son is a local Victorian Coffee shop established in 1865 here in Carlisle, Cumbria. They also happen to be the only Tea Blenders & Coffee Roasters in Cumbria. John Watt & Son was founded in 1865 by John & William Watt in Glovers Row near the existing Town Hall in Carlisle. In 1897 Glovers Row was demolished and Watts moved to their present premises at 11 Bank Street. In 1916 John Watt died and the business was carried on by his son Henry Watt, until his death in 1943. Henry's widow then took a partner, Mr Fred Hodgson, who was a well-known Grocer and City Councillor. Mr Hodgson died in the early 1960's and his widow, Mrs Doris Hodgson, sold the business to Mr Ashley Kendall Snr. His son, also called Ashley ran the business for the next 41 years. Mr Kendall Snr died in early 1979. The last twenty years have seen the biggest changes in Watts. The coming of the self-service supermarkets and out of town shopping has changed watts from a traditional grocers to a Tea and Coffee specialist, providing light meals and a huge range of Teas and Coffees. Raw Coffee is still roasted and blended on the premises. Many of the Teas and blends are unobtainable elsewhere in the county. The shop still carries many specialist grocery items in line with its long tradition. Ashley Kendall Jnr developed the business with a keen sense of tradition and was able to retain much of the original ambiance of the premises. In 2003 Bob & Chris Roberts took over the business from Ashley Kendall Jnr and they are determined to preserve the character of John Watt & Son and to ensure the smell of fresh roasted coffee continues to drift through the streets of Carlisle. I truly wish we had this type of establishment here in California. Unfortunately, Starbuck's has crushed the local competition. Looks like mail order for me.